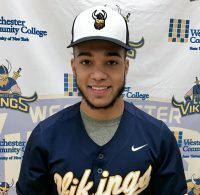 THURSDAY APRIL 4 (Suffern, NY) – Sophomore Sean Vanegas (Bronx, NY/Mount St. Michael) went 3 for 5 with two runs scored, and three different Vikings drove in two runs apiece, but the Westchester Community College Baseball team lost its 2019 Region XV opener with a 14-11 setback to Rockland Community College on Thursday afternoon at Rockland CC. With the loss, Westchester is now 13-5 for the 2019 season. While it was a terrific offensive day for WCC as seven Vikings combined for 12 hits, Westchester’s typically stout defense was another story. WCC combined for eight total errors, and allowed nine unearned runs to allow the hosts to score an important early-season region victory. After the teams were tied at three after two innings, Westchester rallied for four runs during the top of the fourth inning to take a 7-3 lead, and led 10-4 heading into the bottom of the fifth inning, but Rockland outscored the Vikings 10-1 the rest of the way. Sophomore Steve Guzman (Bronx, NY/John F. Kennedy HS) went 2 for 3 with three walks, an RBI, and three runs scored, while freshman CJ Spence (Mt. Vernon, NY/Mt. Vernon HS) went 2 for 6 with two RBI’s and two runs scored. Also for Westchester, freshman Jhojandy Hernandez (Bronx, NY/Salesian) went 2 for 3 with a walk and two runs scored. Freshman Michael Cox (Cortlandt Manor, NY/Walter Panas HS) had a no-decision after allowing two earned runs over four innings, and he struck out four. Sophomores Dylan Sabia (Mahopac, NY/Iona Prep) and Luis Gomez (Bronx, NY/St. Raymond’s) combined to allow only three earned runs over four innings of work. SATURDAY APRIL 6 (Valhalla, NY) – Rockland Community College swept a doubleheader from Westchester Community College during a doubleheader on Saturday, April 6 at WCC. The Hawks edged the Vikings, 7-5 in the opener, and defeated Westchester 15-3 during the nightcap in a five-inning game. During the opener, Freshman Tyler Parshley (Carmel, NY/Carmel HS) and sophomore Sean Vanegas (Bronx, NY/Mount St. Michael) had two hits apiece, and freshman Jake Jempty (Cortlandt Manor, NY/Walter Panas HS) pitched 3.1 brilliant innings in relief, but the Vikings could not overcome a sloppiness in the field despite a late rally. It was another tough defensive game for the Vikings. 48 hours after committing eight errors and allowing nine unearned runs during a 10-4 loss to Rockland, Westchester allowed three more unearned runs after four errors during Saturday’s opener, resulting in the visiting Hawks (13-6, 2-0) to take a 7-2 lead after four innings. From there, the Vikings battled back valiantly, and had the bases loaded and one out in the bottom of the seventh innings, but could not get any closer than the 7-5 final. Westchester led 2-1 after two innings, but the Hawks scored a run to tie things in the third inning, and five more times during the fourth inning to go ahead for good. Westchester loaded the bases with nobody out in the bottom of the sixth inning, and scored twice thanks to a Hailyn Gonzalez (Bronx, NY/Bronx Envision Academy) walk, and a wild pitch that brought home sophomore Steve Messerschmitt (Carmel, NY/Carmel HS) to make it 7-4. An inning later, an Aaron Roman (Pelham, NY/Pelham HS) walk brought home Parshley to make it 7-5 with one out. However, Gonzalez stuck out and Vanegas grounded out to end the game. Sophomore Dylan Sabia (Mahopac, NY/Iona Prep) pitched a strong game but fell to 2-2 after allowing four earned runs over 3.2 innings of work, and he struck out five. Rockland had 12 hits to Westchester’s seven, but the Vikings drew nine walks, while Rockland walked a combined two times. The nightcap featured much of the same as Rockland took a 7-2 lead after two innings and never looked back. Vanegas continued his hot hitting with two more hits to improve his batting average to .344. Relievers Max Marienberg (Scarsdale, NY/Scarsdale HS) gave the Vikings a heroic effort, combining to allow only five earned runs over four innings of work, but Westchester was unable to overcome the early deficit. SUNDAY APRIL 7 (Suffern, NY) – Freshman CJ Spence (Mount Vernon, NY/Mount Vernon HS) hit his first career home run, and sophomore Sean Vanegas (Bronx, NY/Mount St. Michael) continued his recent tear at the plate, but the Westchester Community College baseball team lost its fourth straight game, 11-1 to Rockland Community College on Sunday at Rockland. With the loss, Westchester is now 13-8 overall, and 0-4 in Mid-Hudson Conference and Region XV play. Rockland scored at least one run in every inning but the fourth inning on Sunday, while also limiting the Vikings to four hits and three walks. Vanegas had one of those hits, and is now hitting .500 during his last 10 games to raise his season batting average to .343 after a slow start to the 2019 campaign. He continues to lead WCC in RBI’s (25) and stolen bases (12). For Spence, who is off to a strong start during his rookie campaign, the weekend series with Rockland saw him hit for power as he drilled a home run for the first time in the sixth inning after nearly hitting one during the second game of Saturday’s doubleheader. Freshman Hector Camacho (Harrison, NY/Harrison HS) allowed four earned runs over three innings of work, and sophomore Luis Gomez (Bronx, NY/St. Raymond’s) and freshman Jake Jempty (Cortlandt Manor, NY/Walter Panas HS) were solid in relief, but the effort was not enough as Rockland swept the season series from the Vikings.